Willy is new Tibetan Terrier CC record holder! TIBETAN TERRIER breed history was made at this year’s Bath Ch show when breeder Ken Sinclair & owners Neil Smith & John Shaw broke the breed record with Ch Araki Fabulous Willy, who has amassed 40 CC’s from 38 judges. 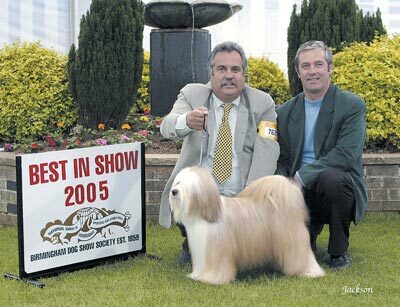 Willy has had a fantastic show career; after becoming a Champion at just 13 months, he was Top Tibetan Terrier 2002 & 2003, Top Utility Dog 2003, being the only Tibetan Terrier to have achieved this. Willy won the Utility group at Crufts in 2004 to then compete for Best in show, handled then by Mark Cocozza. Willy also has many other achievements to his name, including the prestigious Contest Of Champions back in 2003. At the age of five, Willy is now the Top winning Tibetan Terrier of all time, a well worthy winner - Congratulations Willy. The breed record in Tibetan Terriers was formerly set in 1970 by Ch Dokham Cavarodossi of Tintavon; he was the breed’s first All Breeds Championship show Best in show winner. Stop Press! Ch Araki Fabulous Willy wins the CC & Best of Breed & the Utility group at Southern Counties 2006, making this his 41st CC. Congratulations to breeder Ken Sinclair, and owners Neil Smith & John Shaw.